In a large mixing bowl, combine all ingredients except the avocados and mix well. When it is all thoroughly combined, incorporate the avocados and gently mix. Serve immediately or you may cover and chill until ready to serve. Wonderful dish. Thank you. I am celiac therefore, enjoy alot of the dishes you present because they are gluten free. I’m so glad that you can find lots of recipes that meet your needs and that you love, Sheila. I made this yesterday for a big family reunion. What a hit! So happy to hear this, Donna! I saw this recipe on a show on the PBS channel, l came in in the last of it though, so thank God she said the name of the recipe, oh my goodness, l haven’t tried it yet, but I’m stopping at the store to night to get what l need to make it, the ingredients are awesome, so l will be making it tonight. Mexican food is my favorite, of all foods, though Guamanian and Philippino runs close. Thank you for This recipe it is so awesome. I’m so glad you caught the recipe, Nancy! Have fun making it. Never had tomatillos before so I was anxious to make this recipe. Unfortunately couldn’t get ripe avocados so made it without, it was still delicious. A keeper. Love watching Pati, great recipes. I’m sorry you couldn’t find good avocados…but so glad you enjoyed the recipe, Paula! I made your pico de guac last night and it was fantastic. Very refreshing and crunchy and brightly flavored. My brother loved it and is taking what little we had leftover to the restaurant where he works so some of his co-workers from Mexico can taste it. Will definitely make this one again. Thanks. I just made this tonight.. it’s delicious!!!!! 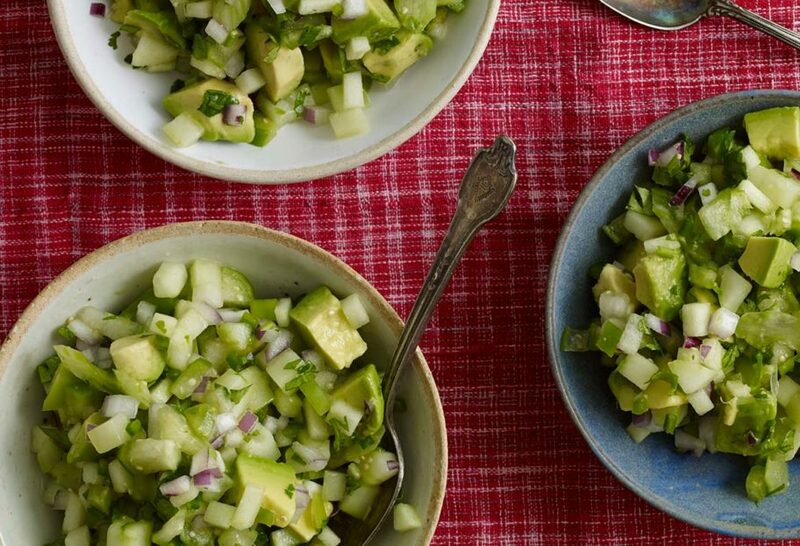 It’s crunchy, fresh and tangy and the avocado adds a great flavor to it. I’m adding this to my recipe collection!! My husband and I are bad at eating fresh veggies.. this makes it easy and something to look forward to.. this will last us a few days! Que rico!! I hope you have more marathons on PBS soon!!! YAY! This makes me incredibly happy to read! OOOOOOOH… much better with avocado! I absolutely love your show and recipes!!!! Thank you for tuning in, Cynthia! I absolutely love your show and recipes!!!!!!!!!!!!!!!!! Making this Pico de Guac for my niece’s 21st birthday tomorrow, going to pair it with chicken mole, rice and potato salad. We’ll see how it turns out. First of all: You reply to comments? You are AWESOME. Second: I watched your show for the first time this weekend and absolutely loved it. I’m totally going to surprise my man with the amazing recipes from this episode when he comes back from his work trip! I’d never heard of toasting pasta in oil before but it looks absolutely fabulous. Thank you for having such a great show and radiating your enthusiasm and positivity! Love! Hola Leticia, I think it goes great with burgers and dogs! I will be making this for my sister this week 🙂 I loved the marathon of your show yesterday, and love Mexican food for the many corn based options that make it gluten free. I also love Mexican food because it TASTES AMAZING! Your recipes are do-able and look simply delicious. I have already shared your page with everyone in my office today! I made this for the 4th of July. Perfect for the pontoon. WHAT A BIG HIT! Thank you! I had to share the recipe with many people ! Next time we might add a couple extra avocados! I love your show. So for the first time in my life I’m going to try to make something I saw on your PBS show. The Chipotle Chicken Pasta Casserole and the Pico de Guac. I’m not crazy about hot stuff, but it looks so good, I have to at least try it. Thanks for a great show, love to watch you and your kids. God bless you and your family and hopefully this recipe will work out. We just had it for dinner last night: I bet you are going to LOVE it just like my boys do, Rachel!